Daniels shows off his dimly lit apartment as if he’s a tour guide. The first stop is a mold-infested bathroom. Then he moves on to the kitchen where he turns his gaze upward. There’s a steady drip of water leaking from his rotted, molding ceiling into six 25-gallon tubs that are neatly lined up on the floor. “I have to set my alarm for every hour and a half,” Daniels says. That’s how long it takes each tub to fill up. He dumps the tubs and goes back to bed. The routine continues during the day. Daniels moved into 6751 S. Jeffery Blvd., a brick midrise with an elegant façade, in 2008. The building has been plagued with problems ever since. On top of the water and the mold, he’s lived with rats that have eaten through the walls. The elevator has been broken for months and, as of early last week, the heat was off. But this isn’t just any private rental. Six units have been occupied by publicly subsidized renters, which means the building should have been held to rigorous inspections. The Chicago Housing Authority is supposed to cut off landlords off if their buildings fail too many inspections. 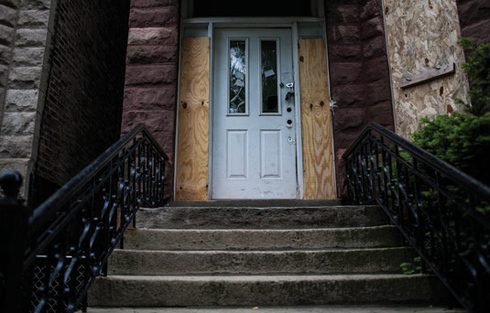 But a Reporter investigation found that 6751 S. Jeffery Blvd.—like thousands of other subsidized private rentals—has struggled to pass for years. CHA inspectors visited Daniel’s building 77 times between 2008 and January of 2013. Only one of every five of those inspections earned a passing score, a Chicago Reporter analysis of CHA data found. Yet the CHA paid at least $178,000 to the building’s owners over that time. That’s on top of rents the owners have collected from the dozens of market-rate renters in the building. 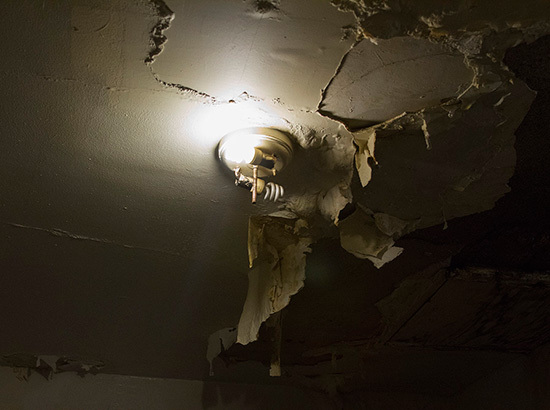 Daniels points to some quick repairs–including patches in the ceiling–that maintenance workers made to his unit so it could eke out a passing score and the rent subsidies, including $725 a month for his apartment, would keep flowing. In October, Daniels was given the green light by the housing authority to move out. He has two months to find a new place or his voucher will expire. But he’s stuck in the same situation that keeps voucher-holders–not to mention other private renters on a tight budget—in substandard units: Until he gets his security deposit back, he cannot afford to move. With the property in foreclosure, that’s proving even more difficult. In June, the mortgage on the building was transferred to PP Chicago 9, a subsidiary of one of CHA’s biggest vendors, Pangea Ventures. In 2011 alone, Pangea collected more than $1.8 million in CHA rents through the voucher program. Pangea declined numerous requests for an interview. Conditions in the seven-story brick building have grown so grim that the city stepped in and filed a lawsuit in August citing a series of code violations, including crumbling fire escapes, shattered windows, unhinged doors and a broken elevator. A judge gave Pangea and the LLC that holds the deed on the property 45 days to make the repairs. They’re still not done and last week, both parties were back in court and given another 30-day extension. Meanwhile, tenants have been told to evacuate the building, which leaves Taverbaugh at a loss. “Pops” has lived in the building for more than a decade. He spends $670 of his $830 social security check on rent so there’s not much room for saving. Unless Pangea returns his security deposit, he can’t move. 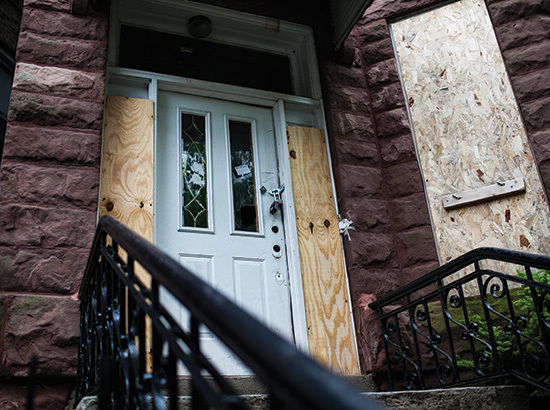 Thousands of Section 8 families ink leases on foreclosed properties. Renters finding themselves evicted when their landlords go into foreclosure are having a hard time finding new housing in an already-saturated rental market, particularly if they are poor, experts said. Chicago has an 80,000-unit shortage of rental housing that would be affordable to households who are renting and earning less than $20,000, according to a Chicago Reporter analysis.